Zipcar, the car sharing company, is introducing a new monthly subscription that gives members exclusive use of a car during the work week. Known as the Zipcar Commuter Plan, for $199/month plus $0.45/mile gets you a personal Zipcar from 5AM on Monday through 7PM on Friday. Although not yet publicly advertised, I found a working link here. More and more Americans are giving up car ownership. Myself included. Living in a big city (Seattle), I have to deal with traffic and high costs of car ownership. A parking spot in my apartment building runs $250 per month. I gave up my car 4 years ago and haven’t looked back. It helps to have memberships in car share services like Zipcar (owned by Avis), Car2Go (owned by Mercedes-Benz), and ReachNow (owned by BMW) in addition to ride share services like Uber and Lyft. When I need a car, I can get one. This week I received an invitation to sign up for the Zipcar Commuter Plan. 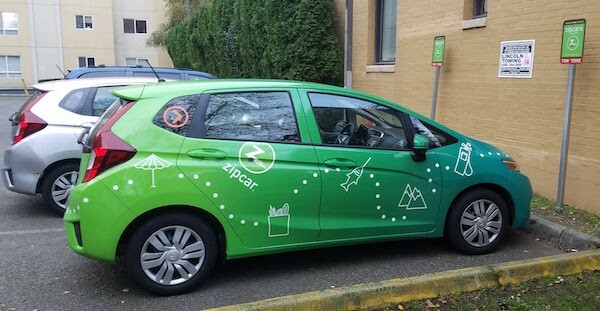 The Zipcar Commuter Plan costs $199 per month (plus taxes — 17.8% in Seattle). On top of that, you pay $0.45 per mile that you drive during the work week. If your commute is 5 miles (one way), that is an additional $100 a month, assuming you aren’t driving it for any other purpose during the week. Compare that to the standard Zipcar fee of $7.50+ per hour. Or $70+ for a 24 hour rental period. All of the standard rentals include 180 miles per day (whether your rental is an hour or 24 hours). It is an additional $0.45 per mile over the 180 mile limit. Exclusive use of your assigned Zipcar any time you need it Monday morning through Friday evening. The cars used for the Zipcar Commuter Plan are compact, efficient cars: Honda Civic, Volkswagen Golf, Toyota Corolla or something similar. Other members will be able to drive it on the weekends. If you want it on the weekend, you pay the normal Zipcar rates. First, it the Zipcar Commuter Plan only makes sense if you live by a Zipcar. This means you have to live in a somewhat dense/urban area. 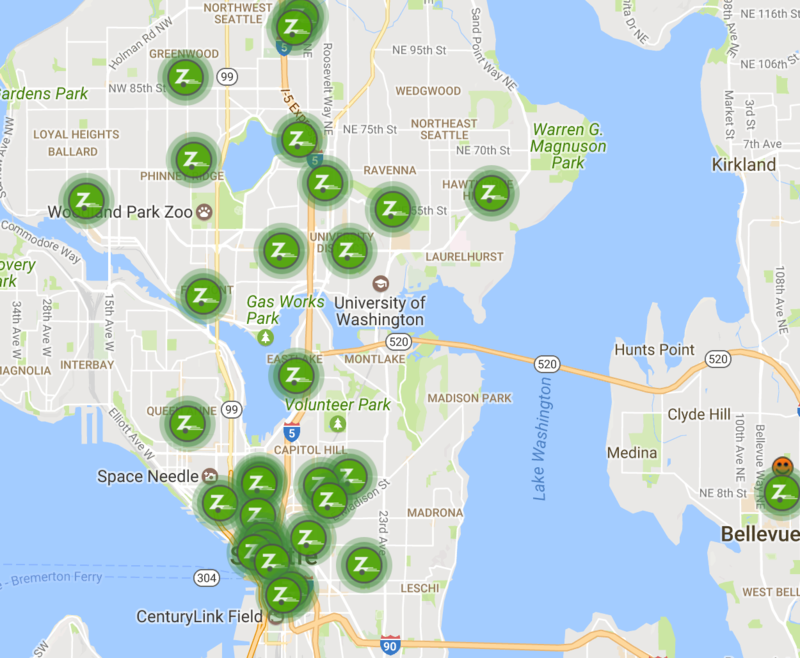 For example, there is a large part of Northeast Seattle that is not serviced by Zipcar. Second, you have to be commuting to a place where you can find parking. You only get one dedicated spot (unlike Car2Go or ReachNow that can park for free even at metered street parking). If you work in downtown, you would have to pay for parking near your work place on top of the Zipcar monthly fee. I suppose you could sign up to have a Zipcar that is parked near your place of work so you have a dedicated spot there. This would mean you would have to bus or Uber down to the work/the car on Monday morning, take it back to your home each evening, then drop it off on Friday and bus or Uber back home. I work downtown and am able to walk to work. However, if I got a job in another part of the city with poor bus service, I could see the Zipcar Commuter Plan making sense for me rather than buying a car. If I were to buy a car, I would likely be playing $200+ a month for the lease, plus $250 for a parking spot, plus gas, insurance, maintenance, taxes…. The $300-400 a month for the Zipcar Commuter Plan seems pretty reasonable. If you are interested in the Zipcar Commuter Plan, visit the sign up page. However, some commenters have noted that they are not receiving a response from Zipcar about their request. If that is the case, please feel free to email me at info at singleflyer dot com and I will connect you to the Zipcar representative that I am connected with. Just include your name and phone number. What do you think? Is the Zipcar Commuter Plan a good deal? Would it be cost effective for you? I got an invitation from Zipcar to join the monthly Commuter Plan which is of interest to me. I completed the online form over three weeks ago and have heard nothing. I have made phone calls to the toll-free number and they have been unhelpful. It seems the customer service folks who answer the phone do not know about this program. The first person I spoke to told me someone would get back to me in 24-48 hours which did not happen. The second person I spoke with referred me to the website “zipcar.com/commuter-plan” where I again completed the online form but now I get some error message. I wonder what other people have been experiencing. Thank you for sharing your experience. I would also be interested if others are having problems getting signed up. Same here, it seems that you are describing what I went trough yesterday! 4/9/2018 still the same since your complaint in 11/2017. I wonder how do this folks do business? So strange. I was able to get set up with the Commuter Plan with no problem. Let me email my contact at corporate and see if I can get an answer. Please feel free to email me at info at singleflyer dot com and I will connect you to the Zipcar representative that I am connected with. Not sure why you aren’t getting a response. I signed up for zip car membership because i need a car to commute to work…i never tried zip car and called the number on zipcar website to ask some questions before i choose a plan.. .waiting over 28 minutes to speak to a representative and still on hold…im starting to regret signup up online and giving all my information and credit card number. Its almost 4pm est , going to hang up soon..this is ridiculous. Have had nothing but terrible problems with this program. Signing up is like a “White-Glove” service where you have to talk with a representative to get acquainted and set-up to use a car. The car that was assigned was a relatively late model Subaru, which was nice, but plastered in promotional Boston Red Sox images and looked absolutely ridiculous. After a week of trying to get a new car (new job and this was a terrible first impression), I was assigned a different car. The new car was filled with dirty cars when I got in it the following Monday. I have come back to the parking spot being taken about 75% of the time, causing me to be required to park illegally next to it (awesome). Now, I’m trying to cancel this membership and have called six times over the last two days asking to get this done. The first time, they told me someone would call back within 24 hours, now (three days later) it’s 48 hours. Still no call… Honestly, this is seriously nothing short of a scam and I cannot recommend you use a different service enough. Maybe someday they will cross a class-action litigation lawyer, until then I’ll just be waiting for someone to call me back and tell me that they won’t automatically charge me $200 tomorrow (four days after the first call to cancel). Don’t use this, it’s awful. YIKES! Sorry to hear your experience! Feel free to email me and I can give you the contact for the person I spoke with at Zipcar about my membership with the Commuter Plan. My email is info at singleflyer dot com.